The 100th Tour de France started today. Wherever you look, there are retrospectives: in magazines and newspapers, on TV and the radio. 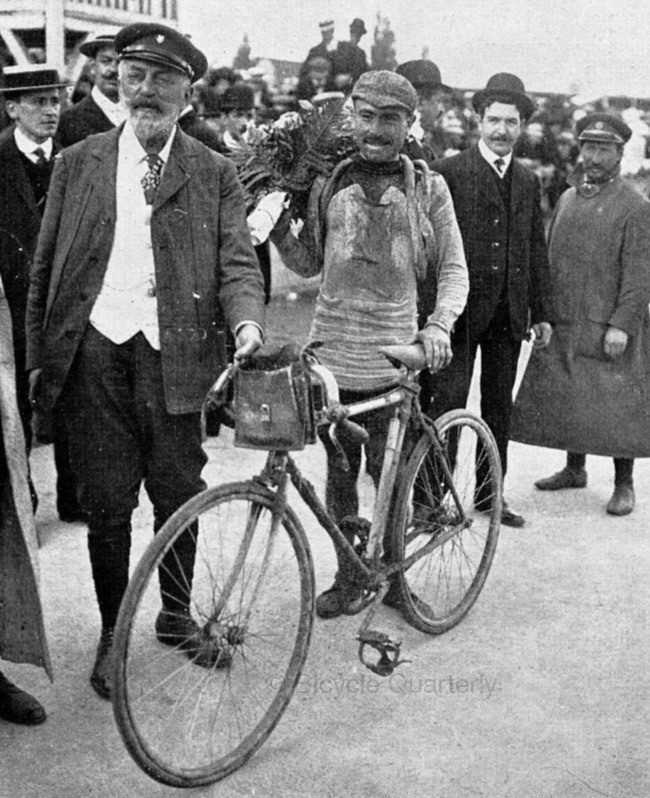 Winners get to write history, and so the role of cyclotourists in the development of the most famous bicycle race in the world remains almost unknown. The Tour de France was shaped at least in part by the animosity between Henri Desgrange and Vélocio. Desgrange was the editor of the sports paper L’Auto that created the Tour. Vélocio’s magazine Le Cycliste that was read by cyclotourists. For years, their respective papers were filled with heated exchanges about the perfect bicycle: the spare, lean single-speed racing bike or the complex, but efficient, cyclotouring bike with multiple gears. Bicycle Quarterly Vol. 5, No. 2 looked at this fascinating history. Desgrange was financed by the bike industry, who liked the profits from the simple, easy-to-manufacture single-speed bikes. Vélocio was the advocate of cyclotourists, who wanted to explore the countryside and mountains by bike, and thus needed more substantial bikes with multiple gears and reliable brakes. The first Tours de France didn’t really go around the perimeter of France, but instead stayed away from the mountain ranges that form the borders with Spain, Italy and Switzerland. The flat course was tailor-made for the single-speed bicycles that the bicycle industry wanted to promote. Vélocio and his cyclotourists left out no opportunity to point out that on their bikes, even riders of average athletic merit could climb the mountain passes that the Tour de France avoided so assiduously. Cyclotourists could only laugh, since they had ridden the Aubisque many times, without getting off their bikes. Not only did they have bikes with multiple gears, but they also had trained to ride in the mountains. Desgrange responded by adding more mountain stages to the Tour. The details of that fascinating story were illuminated in a fascinating article by Raymond Henry, the French cyling historian, in Bicycle Quarterly Vol. 5, No. 2 You can order your copy here. This entry was posted in Bicycle Quarterly Back Issues. Bookmark the permalink. What a fascinating history! I will have to get that issue. Funny how things turn around: Now all racers (i.e., professionals) have mucho gears, while some urban bicyclists/messengers/hipsters (i.e., civilians/non-racers) use only two gears, sometimes fixed and not even a freewheel. I was shouting at NPR radio this morning regarding their story on randonneuring that they should talk to you, when what should happen, I heard your voice in person on Morning Edition Saturday! Bicycling goes round and round. Thank you! That settles it for me. “Heated exchanges” between competing camps is what fosters change. Remarkable history. How strange that racers stayed away from the mountains. Was L’Auto also a magazine dedicated to cars, and Desgrange interested in popularizing The Tour in order to promote the support vehicles that followed the cyclists? L’Auto was called “L’Auto-Vélo” at first, but another magazine objected to the “Vélo” in the name, so they dropped it. The history of the magazine is complicated, but it was intended as a popular magazine at a time when few people could afford cars, so the focus on bike racing came naturally. However, the money behind it came from car (and bike) makers, especially De Dion. Maybe especially so in the US, as racing here was more heavily influenced by track racing up to the 1950’s and 60’s. I started cycling @ 1968 with a mostly racing club–most of the members’ track bikes were newer and of higher quality than their road bikes. One or two participants in club road rides even still had bikes with Cambio Corsa teeth in the dropouts and derailleurs bolted on. I also was delighted to hear Jan’s voice on the radio. Very well spoken and knowledgeable. I was also impressed that the reporter had made the effort to ride at least part of the ride and pedaled as she interviewed riders. If you’re going to do a story on cycling, that’s a good way to do it.. Thanks for the reminder of this article. Jan and Bicycle Quarterly are the reason I know about Randonneuring. Then almost magically a Detroit Randonneurs club started up. My goal was to do a 200K this year, but when I missed the cutoff by 40 minutes, there was a feeling of almost accomplishment. So when the 300K came up last week I said, “What the heck” and tried it. Success this time – with 7 minutes to spare! I love the fact that there is room in Randonneuring for the fast and those who persevere. Now I just have to juggle riding and watching the tour for the next three weeks! My comments almost mirror Matt Sallman’s. Pretty much all I know about randonneuring I got from Bicycle Quarterly, and it was a treat to hear Jan’s voice on the NPR broadcast. Like Matt, I missed the cutoff on my first 200km brevet (got lost in the dark on the Lummi Reservation) by about 30 minutes. But Damn! I made it! That was the important thing. I later did a Permanent 200k and finished with about an hour to spare. Perseverence is what it’s all about, along with just a good feeling of riding with others and experiencing the road, the weather, and one’s own temperment over a long ride. As I get older (turned 67 last month) I find randonneuring to be the perfect kind of physical and mental challenge to hopefully keep me going for another 15 years or so. I may never do PBP or the C1200, but there are plenty of challenges in between.